Force of Will Co., Ltd. will release πth (pi'th) Dimension Battle Royale, the second booster pack set for The Caster Chronicles Trading Card Game, on February 9. Launched last summer, The Caster Chronicles features female magic academy students fighting duels with conjured creatures and magic spells inspired by their elements (see �New TCG �The Caster Chronicles� Launches in October�). The new set focuses on a clash between the characters Heike and Genji, with cards related to them appearing in every element. 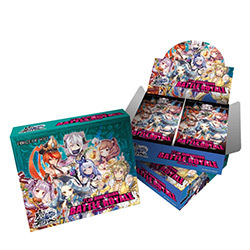 The set will be available in 8-card booster packs, sold in 20-pack display boxes. Each display includes a bonus promo card, and each 6-display carton comes with a bonus playmat.